Our team has produced a new logo; a new layout and design; and a completely revamped and refreshed editorial approach for the Trinidad & Tobago Chamber of Industry & Commerce’s flagship magazine, CONTACT. The new magazine debuted at the Chamber’s 2018 AGM. The feedback has been phenomenal, and we’re excited to share the new CONTACT with you. CONTACT, the premier voice of business, is the ideal medium to achieve these objectives, and will continue to make available affordable advertising rates. Click here for our media kit. For well over 25 years, MEP has published the internationally and regionally distributed iconic magazine brands Caribbean Beat and Discover T&T. 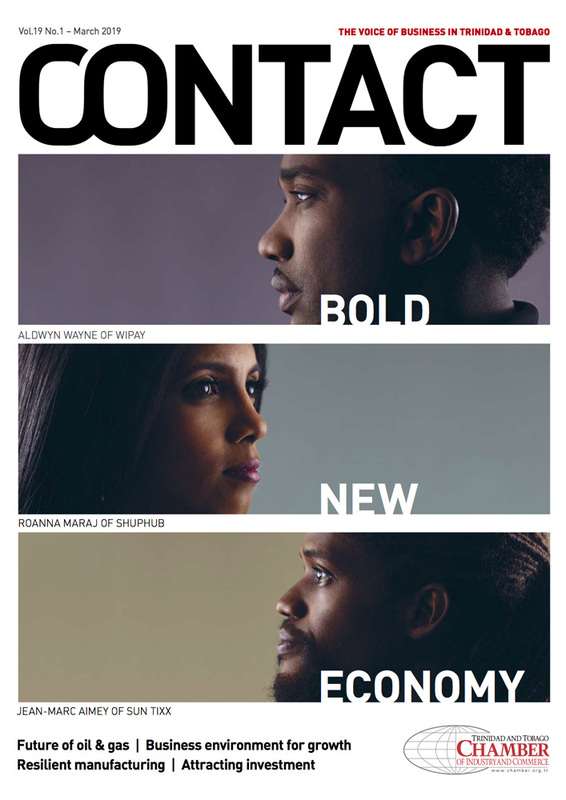 Now MEP embraces a new partnership with The Trinidad & Tobago Chamber of Industry and Commerce to publish their iconic CONTACT magazine. This is a partnership between two experienced, proven, and committed entities, each having specialised acumen, earnestly working to foster economic and social growth. Our intent is not only to inform, but also to equip and enable our readers to make relevant, timely, and intelligent decisions, as the T&T business community navigates through the challenges ahead. As the editorial team engineers insightful articles to inform readers and promote local business, we anticipate the participation of entrepreneurs and corporate executives to share their services, products, and presence within the pages of CONTACT. This newly formed collaboration will continue to expand on the magazine’s powerful, diverse network and broaden its distribution base of 5,000+ key corporate decision-makers — by extension, strategically communicating with the invaluable consumer market. We intend to reach out and seek new readers within T&T, the Caribbean, and international communities. The global landscape is a click away, and it’s imperative that all concerned heighten their marketing exposure collectively, showcasing their diverse offerings in a comprehensive and one-stop convenient print platform. In publication since 2000, the magazine has firmly established itself as staple reading for the national business community and as well as for overseas investors and other stakeholders beyond our shores. CONTACT provides a forum to inform about current business issues nationally, regionally and internationally. The magazine has a strong specialised thematic content, written and researched by respected business leaders and writers. Because of its focus, the publication has wide appeal, and is circulated to key executives and leaders in the business community, Government Ministries, diplomatic missions, tertiary educational institutions, libraries and business development institutions locally, regionally and internationally.